The Life of Bon: This is not a love note. He slipped it to me shyly after fifth period. "This love note isn't for you, exactly. I just thought you would enjoy it," he muttered, looking down. Then he turned around and shuffled his way out of the classroom, never meeting my eye. 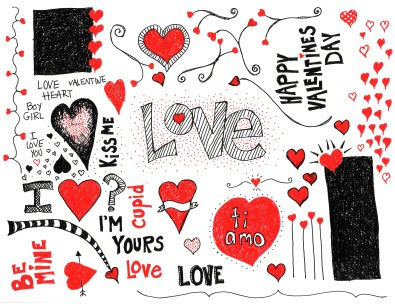 The note was decorated with hearts and folded in a typical middle school note folding fashion. On the front was the disclaimer, in all caps "THIS IS NOT A LOVE NOTE," and then with an arrow pointing to a heart, "But this is a heart." I waited until all students were out of the room, sat down at my desk, and examined the note, half expecting that at any moment it would explode into a homemade concoction of hearts and confetti. I briefly considered just throwing it away. Never dealing with the uncomfortable love confession (or was it to be a hate confession?). Never having to talk to an administrator about the school boy crush. Never having to avoid his gaze in class. Just pretending like the whole thing never happened. Curiosity has always had a strong hold on me, however, and I quickly decided the best thing to do would be to just open it up and bravely confront the contents of this "unlove" note. Cautiously, I unfolded the piece of notebook paper. Which cause you to either barf or your restraints fail and you fall to your death. *note that was written when i was single in 8th grade. Because I was bored in a week long health class. I'm sure you can imagine this note left me with many a question. Why the pink and red cursive? Why the negative feelings about love? Why had he saved it for three years? What am I supposed to say to Daniel in class next time? Why did he give it to me and then bolt? And the most burning question of all-- exactly why did Daniel just "have to share" this with me? Ah, these kids. Right when you think you have them all figured out, they throw you a curve ball. With hearts on it.